Pipkin baked a carrot raisin cake spiced with cinnamon and nutmeg and topped off with a orange zest cream cheese frosting (and raisins for eyes!). 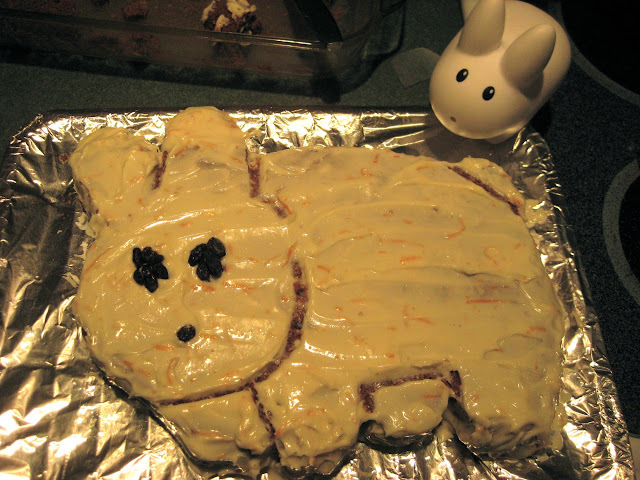 A couple friends from New Jersey moved to Burlington, VT this weekend, and since Matt likes carrot cake with cream cheese frosting...naturally Pipkin had to make a labbit shaped Year of the Labbit cake to welcome him! 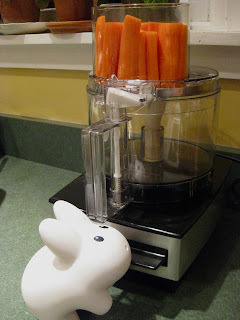 Pipkin never uses walnuts because he's allergic to them, but feel free to add in a 1/2 cup of chopped walnuts and take out a 1/2 cup of the raisins, or 1/4 cup of the raisins and 1/4 of the carrots to compensate. Click here for a printable version of the recipe. 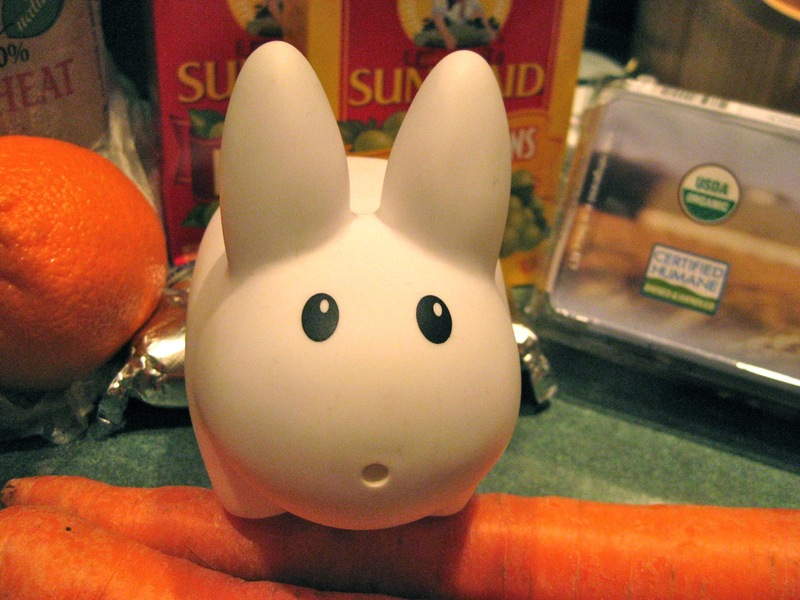 Happy Year of the Labbit! Labbit gathers his ingredients together. Preheat oven to 350 F. Grease a 9" x 13" baking pan, or use mini bundt pans, bread loaf pans or even line muffin tins and make muffins. 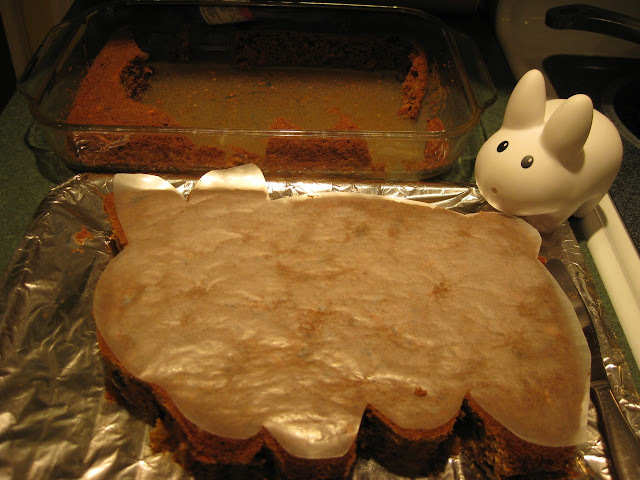 Pipkin went with the baking pan so he could turn the cake into a labbit shape. 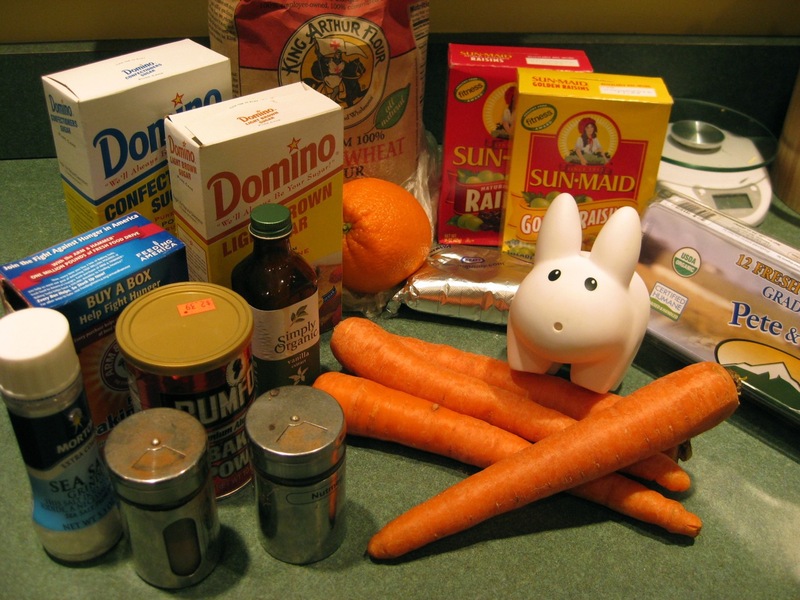 In a large mixing bowl, whisk together flour, baking soda, baking powder, cinnamon, nutmeg, and salt. Set aside. In a smaller bowl, beat brown sugar, vegetable oil, and eggs until well-combined. Add egg mixture to flour mixture and mix well. 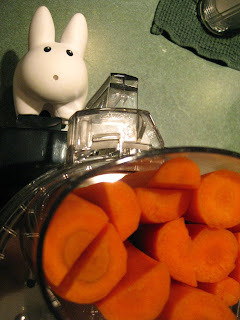 Stir in raisins, and carrots (and chopped walnuts, if you choose). Mix until evenly distributed. Pour into prepared pan and bake about 30 minutes or until a toothpick inserted in the center comes out clean. Cool to room temperature. Beat cream cheese and confectioner's sugar until smooth. Add in the orange zest and mix until evenly distributed. Spread on cooled cake. 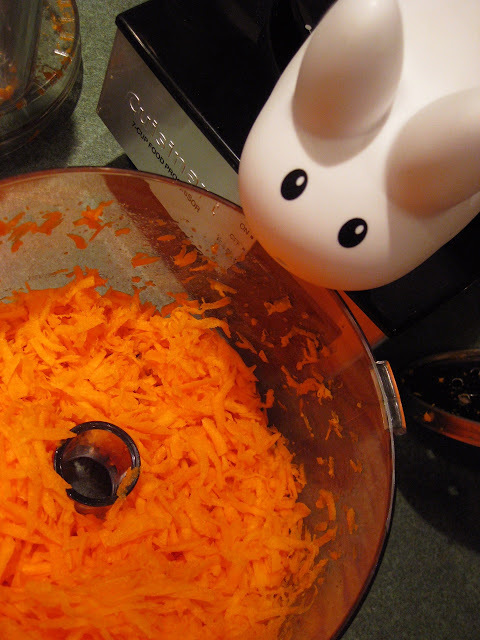 Naturally, labbit selects only the best carrots for his carrot cake. The "Ferarri" is loaded up and ready to shred. Good enough to swim in. 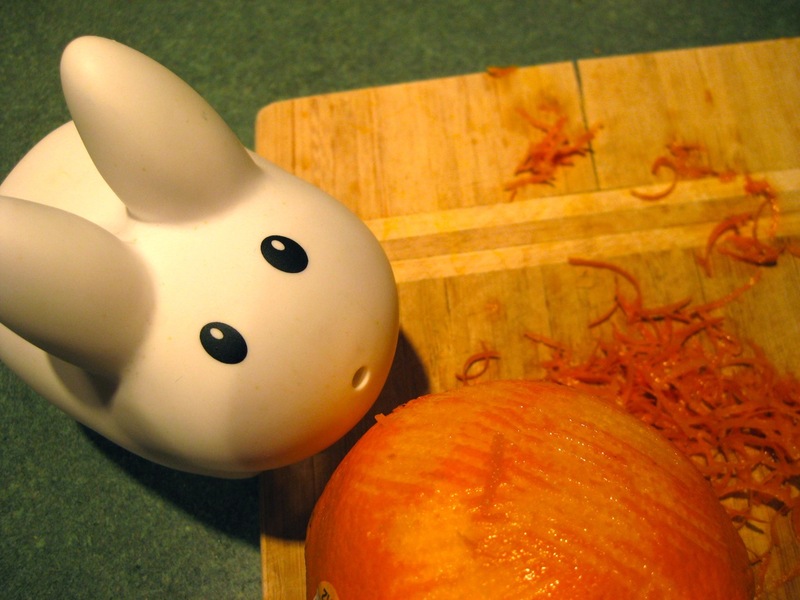 With tooth and claw, labbit zests an orange. 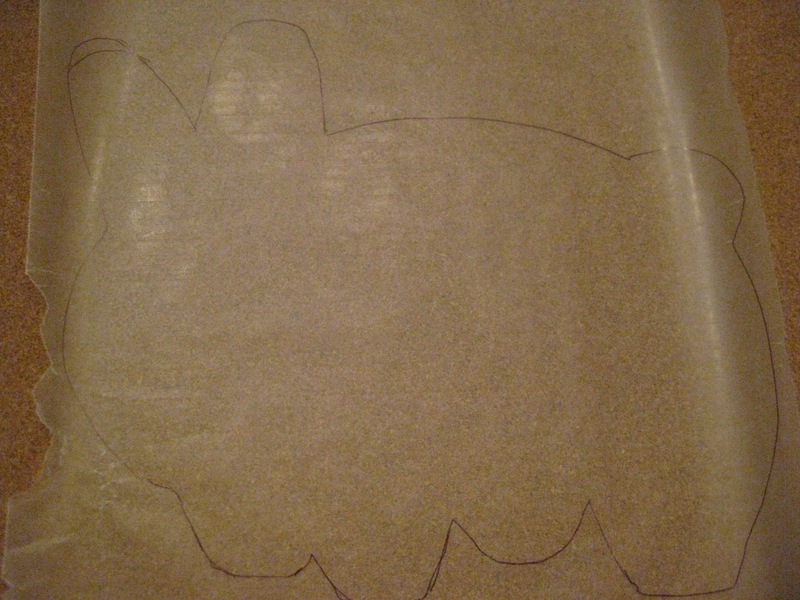 ...then copied onto wax paper and transferred to the cake. A labbit shape is cut out, and the fallout pieces are used to make up his ears. 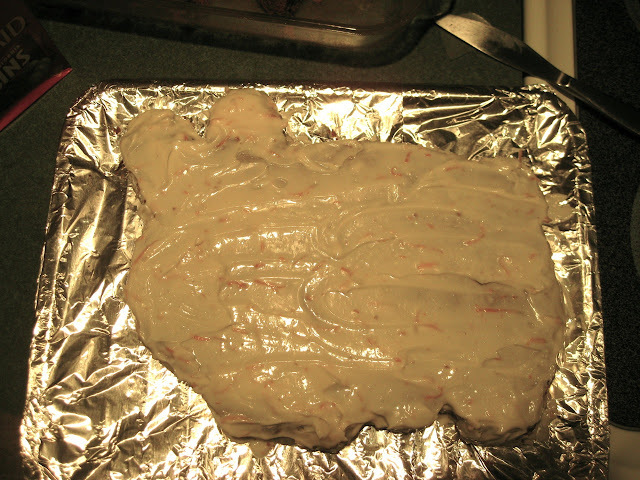 Frosting covers the ear seams. As someone who loves labbits I am delighted to have found your site. I am a mad keen baker so it is good to find a reliable source of recipes to keep my collection happy! Love it. So glad you found my labbit friends here. 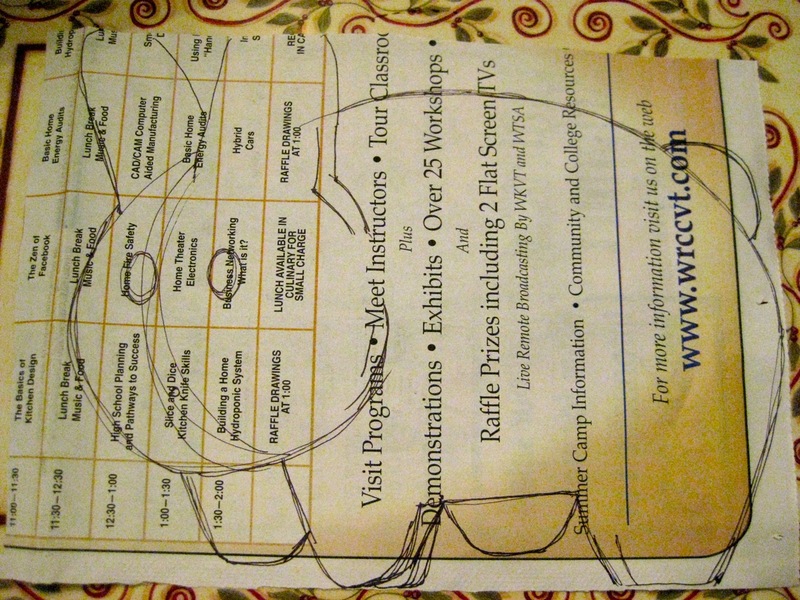 :) I am not a mad keen baker or cook, but this blog was a way to challenge myself to cook and bake things other than my old standbys.